Selbyville, DE June 5, 2017 – Bayside, a Carl M. Freeman Community was awarded ten Regal Awards by the Home Builders Association of Delaware, a member of the National Association of Home Builders (NAHB). 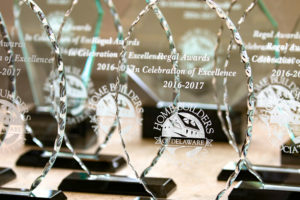 The Regal Awards have been recognizing excellence in Delaware for over 25 years; spotlighting outstanding achievements in the state’s Home Building Industry. The 2017 Regal Awards were held on Friday May 19th at Irish Eyes Restaurant & Bar in Lewes, Delaware. The family beach and golf community won the prestigious Regal awards for: Sussex County Community of the Year, The Best Print Ad, The Best Amenity Value, The Best Social Media Campaign, The Best Email Blast, The Best Informational Brochure, The Best Event Promotion, The Best Exterior Merchandising, The Best Overall Marketing and Delaware’s Community of the Year. Ideally situated in Fenwick Island, just four miles from the beach, Bayside comprises nearly one thousand acres overlooking the Assawoman Bay and features an 18-hole Jack Nicklaus Signature Golf Course. Opportunities for family fun and resort living, with community pools, tennis complex and programs, kayaking and paddle boarding, stocked ponds for fishing, walking and fitness trails, delicious dining and special activities for kids of all ages. Opening in September will be the year-round indoor pool and state-of-the-art fitness center, which will offer another opportunity for Bayside’s family and friends to gather together. For 70 years the Carl M. Freeman Companies has created places that enrich lives through their innovative and inviting places to live, work, shop and play. The company has developed and managed more than five million square feet of commercial space for shopping center and office use, servicing more than 1.1 million square feet of retail; built award-winning beach-front and golf course communities; and developed more than 20,000 homes in 50 residential communities across Delaware, Maryland and West Virginia. The Carl M. Freeman Companies is headquartered in Rockville, MD with a complementary office in Selbyville, DE. For more information about Carl M. Freeman Companies and their diverse interests, visit www.freemancompanies.comor call 302-436-3000.